“[House Chairman] Sanchez said the House version of the bill eliminates some of the more contentious parts approved in April by the Senate including sections placing restrictions on the right to public assembly and allowing the arrest of individuals without warrant. BOSTON –Public health officials would have the power to isolate individuals and order quarantines to contain the outbreak of serious contagious diseases under a bill approved by the Massachusetts House on Thursday. Supporters say that while the bill has been in the works for years, the emergence of swine flu shows the importance of having laws on the books to deal with public health crises. Critics say the bill gives the government too much power. The bill, approved by a 113-36 vote, is designed to clarify the authority of government and the rights of citizens in the case of a public health crisis. Backers say under existing law there are few checks on the power of government once the governor declares a health emergency. “The bill strikes that balance between protecting the community in the case of an emergency but also protecting the civil liberties of individuals,” said Rep. Jeffrey Sanchez, D-Boston, House chairman of the Committee on Public Health. Sanchez said the House version of the bill eliminates some of the more contentious parts approved in April by the Senate including sections placing restrictions on the right to public assembly and allowing the arrest of individuals without warrant. The Senate bill would also allow the government to mandate vaccinations or place into isolation anyone who refused to be vaccinated — a provision that was eliminated from the House version. “This bill does not change the law to force people to be vaccinated,” Sanchez said. The bill spells out the authority of the public health commissioner once an emergency is declared — including the power to force the evacuation of public buildings and order health care facilities to provide services to those sickened. The bill would also let the commissioner limit public access to contaminated areas, adopt measures to safely dispose of infection waste, and store and distribute antitoxins, serums, vaccines and antibiotics. The isolation or quarantine order can be made orally as long as it is followed by a written order. The bill allows those in quarantine to appeal to a Superior Court judge. It also bars employers from firing workers because of a quarantine order. Rep. Todd Smola, R-Palmer, said he heard from dozens of constituents worried about the Senate version of the bill. He said there wasn’t enough time to study the changes in the House version, which he said still gives too much power to the commissioner of public health. “People have enough concerns right now relative to government control invading in their personal space and in their personal lives,” he said. Other parts of the bill are designed to send up early warning signs of a potential outbreak, including requiring pharmacists to report increased prescription rates or unusual types of prescriptions. Public health officials would also be allowed to obtain medical records to try to investigate or monitor an outbreak, provided that the medical records remain confidential. The public health emergency would end whenever the governor says it is over or 90 days after it was first declared, whichever comes first. The compromise version of both bills must now be worked out. Most H1N1 flu vaccination will be made available sometime during October in the U.S.
We spoke with Bob Dwyer, a district coordinator and citizen advocate for the Liberty Preservation Association of Massachussetts (Mass LPA) to update us on the status of S.2028. The bill is currently still in the Ways and Means committee. MASS LPA is composed of grassroots citizen advocates who are confronting their local lawmakers about the Constitutionality of S.2028. We asked him about his organization’s recent actions and the effort to stop Massachussetts from becoming a precedent setting state for both pandemic tracking and mandatory administration of a flu vaccine. Dwyers group organized to confront State legislators on issues of Constitutionality. They interpret S.2028 to be a mandatory or coercive vaccination law for their state. We learned earlier, S.2028, potentially would criminalize State citizens for not taking the flu shot with imprisonment and fines of up to $1000 a day. In addition to taking time out to speak to us about the bill and local opposition to the mandates. Dwyer explained that the State of Massachusetts is distributing 2 types of flu shot: a seasonal flu shot which has been tested extensively and the H1N1 flu shot. 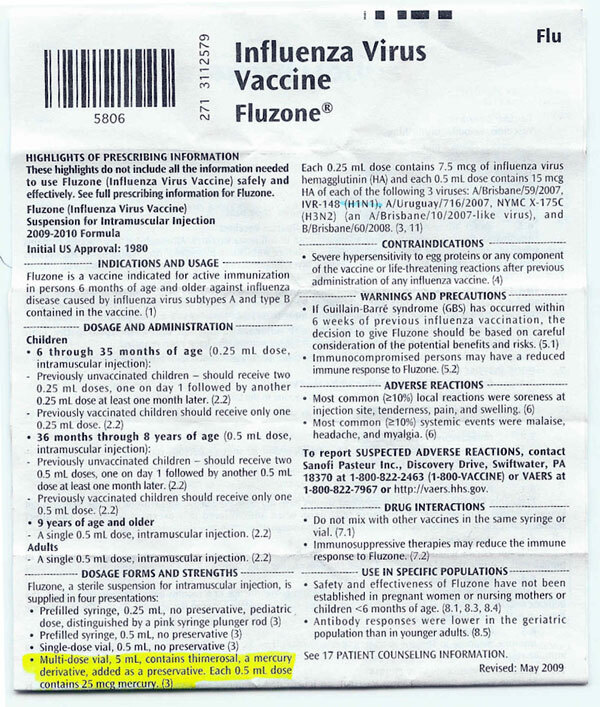 The Sanofi-Pasteur Fluzone seasonal Flu shot, expected to be distributed nationally in October, contains the poisonous and damaging natural element, Mercury or mercury derivatives and the H1N1 virus itself. We will be asking the makers of these H1N1 vaccines if they have started adding a nano technology developed by VeriChip to vaccines distributed to hospitals in the United States for intended injection during flu season. If you have taken this brand of flu vaccine and are suffering from symptoms of Guillain-Barre Syndrome(GBS), which attacks the nervous system and afflicts basic motor functions, please call 1-800-VACCINE. GBS has no known cure, but symptoms can be lessened with treatment.